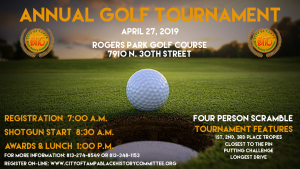 It’s that time again to prepare for our upcoming 4th Annual Golf Tournament, scheduled for Saturday, April 27th at 8:30 am Rogers Park Golf Course. The golf committee is looking forward to another great event to support our scholarship program and community outreach. Download and print the registration form by clicking here. Join Us for Future COTBHC Events! This event supports the 2019 COTBHC Scholarship Awards in providing scholarships to outstanding high school graduates before they head off to the college or university of their choice. This event also offers a great opportunity for your organization to reach the Tampa Bay area with your brand and targeted message via the golf tournament.